Project managers learn early never to read too much into policy pronouncements. But when your unfunded project is the first among many listed in the government’s new defence policy, you have reason to be optimistic money may soon be coming. “There are lots of priorities, but we are definitely a key one,” Captain Glenn Imperial said in an interview shortly after the defence policy, Strong, Secure, Engaged, was released in June. Imperial is the project director for Ground-Based Air and Munitions Defence (GBAMD), a program to acquire the systems and associated munitions to protect land forces against airborne threats. The project, singled out by the government several times in the policy as one of 10 investment priorities for the Canadian Army, is a critical need – it was among four capability gaps briefed to industry during the Army Outlook in April – but while a project office has been working the problem since 2008, it has yet to receive the funding approval to see it to fruition. The Army acquired a range of ground-based air defence systems in the mid 1980s and, for much of the two decades that followed, fielded a layered system of man-portable missiles, radar-controlled guns, and vehicle-mounted surface-to-air capabilities to protect events such as G8/G20 meetings, the Winter Olympics, and deployed headquarters and airfields. But all have since reached the end of their respective service lives – the last was phased out between 2012 and 2016 – and today the Army has no ground-based air defence capability. “We have been out of ground-based air defence since 2012. The price for [the capability] is not cheap, but it is such an important system that, with today’s events, we have to make sure we get it back,” said Imperial, a field artillery officer and surveillance target acquisition qualified gunner. The Army’s traditional air defence role has focused on low level threats from fixed and rotary wing aircraft such as bombers and attack helicopters. The systems of the 1980s included the Thales-built Shorts Missile Systems Blowpipe, a shoulder-launched surface-to-air missile that was later replaced by the Javelin GL, which deployed on a frigate during the first Gulf War in 1990; the Oerlikon-Contraves GDF 35mm twin cannon, a towed anti-aircraft gun with a Skyguard FC radar system; and the air defence anti-tank system (ADATS), an Oerlikon Aerospace manufactured dual-purpose short range surface-to-air and anti-tank missile system mounted on an M113 chassis. While those traditional threats remain, GBAMD must also factor the emergence of armed and swarming drones, a capability that ranges from crude home-built prototypes to cutting-edge systems that will become only more effective as artificial intelligence improves. The Israeli military, for example, confirmed in July the purchase of small multirotor UAVs for urban warfare, able to carry a machine gun, a grenade launcher and other weapons. The project’s high-level mandatory requirements are still being defined. But as Imperial and his team prepare the paperwork and engage with industry to understand where the technology is going, ensuring a future system fits within the Army’s operating concept of adaptive dispersed operations is critical. The system will also require its own radar or integrated radar feed, and the command, control and communications capacity to network with the Army’s Land Command Support System and the Airspace Coordination Centre (ASCC). “The medium range radar (MRR) and ASCC modernization projects, both of which are in implementation, will be critical to the success of GBAMD,” Imperial said. “The MRR will feed the local air picture to the ASCC, which will help populate the larger recognized air picture, which is also informed with information from higher sources such as NORAD or an AWACS (airborne warning and control system aircraft). So part of this project is to help feed into that, and possibly even for them to feed information to the user on the ground. “We would then have that digital information chain: There is a target coming from 150 km away, it was then detected by the MRR, and now we have it on our radar system at around 40 km and can engage,” he continued. By connecting with LCSS, the Army’s digital backbone, and other soldier systems, air defence operators would also have a better understanding of blue force positions. “We want to make sure everyone is communicating to reduce fratricide,” Imperial said. For a project with limited traction in recent years, Imperial has seen a lot of industry interest. While the project team has been willing to sit down with any company – “sometimes you don’t know what you don’t know, so having a small company bring forward an idea or possible solution is important,” he said – there are a few questions he always asks. The project team is working with the Royal Regiment of Canadian Artillery School and the Canadian Forces Army Warfare Centre to frame the requirements. It is also monitoring the experiences of allies through regular exercises and a NATO ground-based air defence working group. Although the definition phase of the project is not slated to begin until 2020, Imperial has some ideas about the future system. Whether that’s another layered approach or a single system remains up in the air. Multiple systems would be the ideal if money were not a factor, he acknowledged, but an assessment with the Air Force and Navy of the direct threats GBAMD will have to counter will likely dictate the Army’s approach. 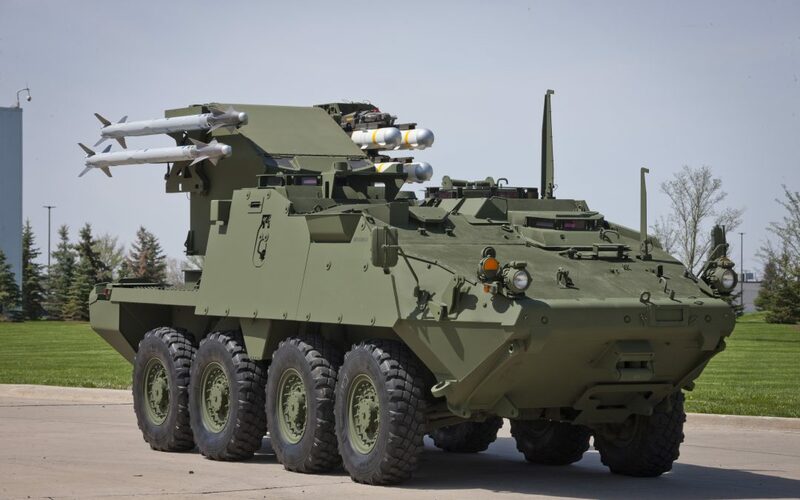 General Dynamics Land Systems, for one, is exploring the potential for a multi-mission Stryker-based platform for counter UAS and CRAM that would negate the need for another crewed vehicle in the US Army. “We are looking at how to put [high energy] laser capability, perhaps some electronic warfare capability, maybe even acquisition radar capability, on to a recon vehicle, operated by scouts, that could provide this kind of coverage to their parent unit. 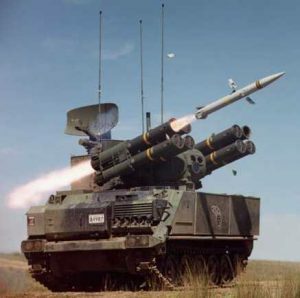 Or put it on an artillery observer’s vehicles and give them an added capability or second mission to make them a fires integrated platform combing air defence and artillery,” Tim Reese of General Dynamics Land Systems told the Association of the US Army in 2016.